Well, this turn a turn didn’t it. In the back of my mind, I was always wondering when the higher action portions of the show were going to weave their way into events. But as things were progressing, I was enjoying the more mundane, and lower stakes adventures. Seeing a bunch of character development was a refreshing departure for me. Well, the rug has been pulled out from all of that now. As this episode begins, we learn that the Psycho Helmet religion have received a significant bump in funding, thanks an anonymous donation from the wealthy businessman whose daughter Mob rescued a few episodes back. The religion, while exploding in popularity, apparently had no real drive or message behind it, their entire reason for existing is to find the person who inspired them to group together. Sitting amongst them is Ichi; the news club member who knows exactly who they’re all looking for. But she continues to try and orchestrate events on both sides because… it’s fun? I’m still not sure about this character, I get the feeling she has some ulterior motive, but knowing this show, she probably is just doing it all for shits and giggles. 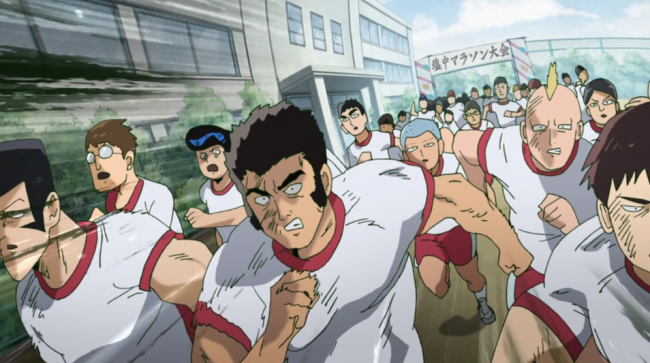 At school, she approaches Mob as suggests he use his powers to win an upcoming school marathon and reveal himself to the group. Mob is initially excited to learn about a “fan club”, but then is deflated when he realises its the religious group that he apparently knows all about thanks to their crudely drawn flyers. Seriously, over 700 members strong and they don’t have anyone with an art background. Obviously, Ichi hasn’t been as privy to Mob’s recent character development as we have, as he refuses and tells her he intends to place top ten without using his powers, so he can impress and then ask out the girls he’s been crushing on since the start of the series. There is some flagrant exposition here, just to let us know how Mob has matured since his early days in how he deals with both Ichi and the upcoming marathon. What follows is training montage,one that features all of Mob’s friends and family banding together in support of him achieving his goal in this upcoming race. It’s a real feel good moment that makes me realise how well this show has been building up to the end of this episode. But I’m not going to go there just yet. 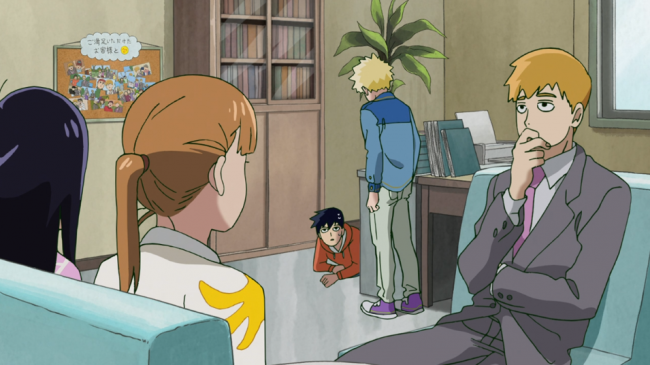 In the meantime, the girl he has been crushing on shows up at Reigen’s place, totally by chance. While there, she apparently realises that Mob had been working for Reigen and then asks him some probing questions. It just so happens that Ritsu is there and misunderstands the situation, thinking that the Takane has a boyfriend already. It creates a little conundrum for him as he ponders whether he should tell Mob or not. Once we get to the marathon itself, everything is set up for things to work out in either spectacular success or failure for Mob. It seems to be somewhere in the middle, as Mob is knocked down and hurts his leg right as the beginning of the marathon, pretty much taking him out of the race right away. But, through sheer stubborn determination, Mob continues to run. He doesn’t get a Run Fatboy Run ending to his story though, as he ends up causing himself to pass out unconscious towards the end. Then things take a turn. All this teenage drama, all this talk of being your best you. It all comes crashing down when the red headed esper from the end of series one suddenly shows up on Mob’s doorstep. Mob, arriving late from the doctor’s office, finds his home ablaze. Slowly he enters and inspects the house, using logic to convince himself that his parents wouldn’t be careless enough to be inside the house when it caught fire. Then, as he enters the final room, he is confronted with his worst fears. 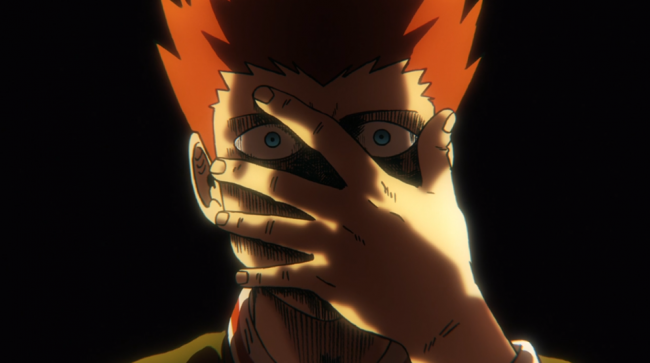 I have been spending a lot of time praising Mob Psycho for its character development, endearing me to the characters, and their very relatable plight as the most dangerous situations they tend to encounter are dealing with their relationships. It takes some well crafted investment in the story and its characters to make a sudden turn like this all the more impactful. We’re all in Mob’s corner, his dogged willingness to do his best has made the majority of this series pretty upbeat. Now though, things are different. Mob’s personal journey to impress the girl he likes is utterly worthless in the face of what has just happened to him. I’m really interested to see where things go from here. There have been rumblings of what Mob could become if he gives in to his darker urges, at this point, I can’t see a whole lot bringing Mob back out of whatever road he’s been thrown onto. 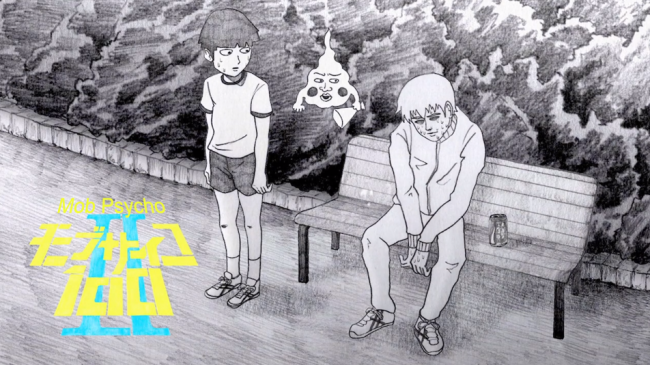 Posted on February 28, 2019 February 28, 2019 by WooderonPosted in Anime, Condensed Reviews:Tagged episode 8, Even Then ~Continue Forward~, mob, Mob Psycho 100, Reigen.